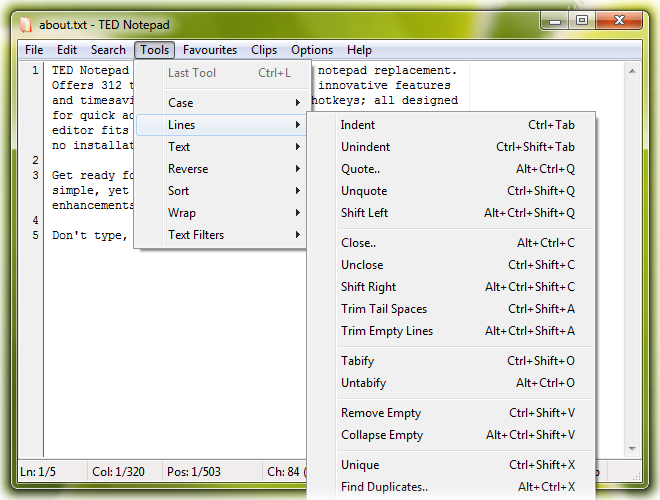 TED Notepad is a free light-weight notepad alternative. It offers 352 text-processing functions, innovative features and timesaving tools. All of them on hotkeys; all designed for quick and advanced editing. It is portable and loads instantly with no installation required. + Added: Support for IME composing window. + Added: Added support for DPI-aware scaling. + Added: Push Line Up and Push Line Down for moving lines around. + Added: Drag&amp;Drop editing; moving text by mouse is available via both buttons. + Added: Setting: Auto-save Untitled documents (into the Temp path). + Added: Setting: Store auto-save files in the Temp path instead of current directory. + Added: Setting: Store backup files in the Temp path instead of current directory. + Added: Setting: Temp path for storing autosave and backup files to, with relative paths support. + Added: Setting: Create backup files with hidden attribute. + Added: Setting: Create multiple backup files and rotate them. + Added: Setting: Warn on loading binary files. + Added: Setting: Ignore case in quick Sort tools. + Added: Check for Updates and Automatic Check for updates. + Added: If there is a new version available, hint is displayed in the StatusBar. 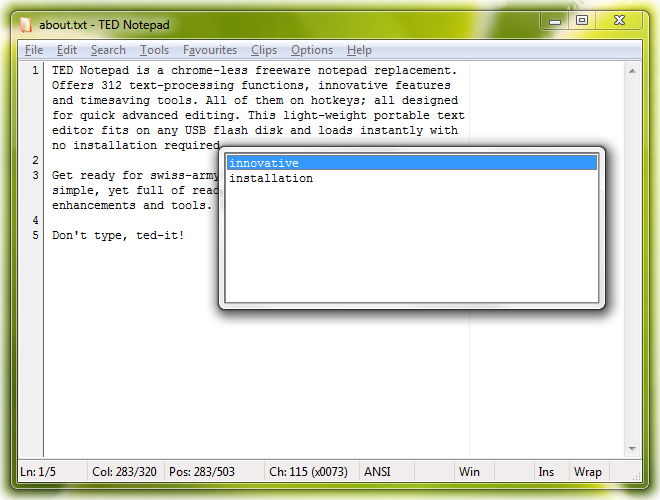 + Added: Command line parameter: /u Check for Updates. + Added: Command line parameter: /l Goto Line accepts negative numbers and works from the end. + Added: Command line parameter: /c Goto Offset accepts negative numbers and works from the end. + Added: Command line parameter: /s Set Selection accepts negative numbers and works from the end. + Added: Command line parameters: /l Goto Line and /c Goto Offset can be used together. - Fixed: Italics fonts are no longer clipped. - Fixed: Selection background does not clip nearby characters anymore. - Fixed: Each tab character now enforces at least some minimum visual extent. - Fixed: Selected end-of-line extent and visible end-of-line extent were unified. - Fixed: When switching to another instance of the same document, no unexpected questions are asked. - Fixed: Message about another instance takes precedence over message about lost auto-save found. - Fixed: Document is not auto-saved if there are no modifications since last auto-save. - Fixed: The user is now warned that it is necessary to save recovered document. - Fixed: Auto-save file was not always removed after successful recovery. - Fixed: Canceling Revert operation no longer removes current auto-save. - Fixed: Chosen encoding or code page is no longer reset during Revert. - Fixed: Overwrite flag is no longer reset during Revert or Re-open. - Fixed: Creating a new file during loading adds such new file to Recent files. - Fixed: Relative paths are supported for Template file and are not updated during loading. - Fixed: Changing current encoding also changes BOM flag to reasonable default. - Fixed: Default newlines are used upon no newlines in the loaded file. - Fixed: Default newlines are used upon mixed newlines in the loaded file when No mixed newlines are in force. - Fixed: Default newlines are used upon mixed newlines in the document if No mixed newlines are turned on. - Fixed: Lists of available codepages split into categories for easier navigation. - Fixed: Shift+BackSpace deletes previous character just like a simple BackSpace. - Fixed: Insert Recently Inserted text was needlessly unavailable sometimes. - Fixed: Sorted Complete Word dialog was inserting incorrect suggestions. - Fixed: Right-click menu could appear on a wrong position upon several displays. - Fixed: Scrolling by mouse via selecting text outside of edit window has been slowed down. - Fixed: Message is displayed after successful replace and no further occurrences. - Fixed: Replace tool used empty string upon undefined back-references, instead of skipping such occurrences. - Fixed: Propper icon recovery while re-starting crashed Windows Explorer. - Fixed: Keyboard focus was not relinquished properly upon Hide to Tray. - Fixed: Saving widnows position and/or size and restoring them was reviewed. - Fixed: Config INI file is only updated upon actual changes in the config data. - Fixed: Some funky edge cases were fixed in various tools and features. * Esc key cancels any ongoing mouse operation. * Right-click can also be used to select text before the Right-click menu appears. * Paste from clipboard thru Ctrl+Right-click occurs only upon releasing the button. * Selected lines are slightly accentuated by double-drawing the text. * ODO meter and Trip meter were added to the Utility info dialog for amusement. * Overwrite mode menu item added to Options menu for convenience. * Date/time glue setting moved from the Tools page to the General page. * Warning is show in the Status Bar upon saving Unicode file with no BOM. * Document title is always displayed in the taskbar and caption, even if also showing the full file path. * Stay on Top is saved along with other common options in the Basic Options category. * Newlines are now decoded in Could not find messages; with a new setting to disable this. * Progress percentage during re-wrap has been rewritten to give a more linear user experience. * The .reloc section was removed from executables in a hope all future Windows will accomodate. * Executable code was moved back to the .text section where it belongs. * Read-only data was moved back to the .rdata section where it belongs. * Text storage engine improved to support files with truckload of lines. * Text storage engine memory usage and general behaviour optimized. * Edit box behaviour and other code optimized. * Utf-8 recognition algorithm fortified. 878 1,994 Medvedik, Juraj Simlovic <img src="http://www.oldergeeks.com/downloads/gallery/thumbs/TED Notepad1_th.png"border="0"> Mar 20, 2018 - 11:36 6.1.1 121.8KB ZIP , out of 11 Votes.